The preparation is the easiest way I know to make fish. You simply combine all the ingredients in little packages, place in the oven and wait for it to be cooked. Cut 5 pieces of aluminum foil and 5 pieces of parchment paper. 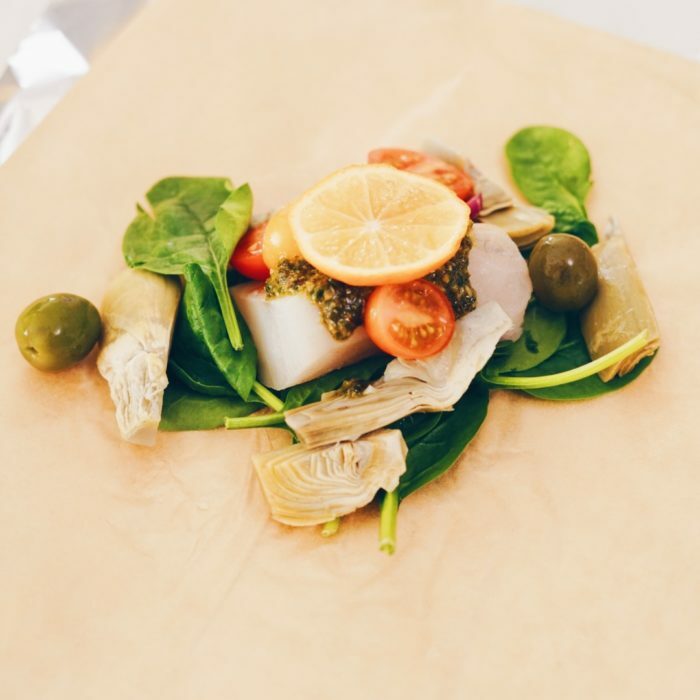 Place 1 piece of parchment paper on top of foil and add a small bed of spinach and the fish. Spread 1 tbsp of pesto sauce, a couple of olives, cherry tomatoes, 2-3 slices of shallots, 1 slice of lemon, 1 drizzle of olive oil and finally some salt and pepper. Fold the foil to create a closed package and repeat with the other pieces of fish. Place all the fish packs on a baking tray and transfer to the oven for 12-15 minutes until fish is flaky and cooked through. When done open the packs and sprinkle some fresh basil leaves on top. Enjoy with some rice (cauliflower rice), mash potatoes, or green veggies.